Located on Baja California's most exclusive and private beach, along the Pacific Ocean side and a few steps from the Land's End and the famous natural arch, this charming, Mexican hacienda style all-suite resort sits on eight acres of beach, only a few steps from the sparkling Pacific Ocean and a few minutes' walking to downtown Cabo. This is a dramatic setting to relax and enjoy your dream vacation under the sun. 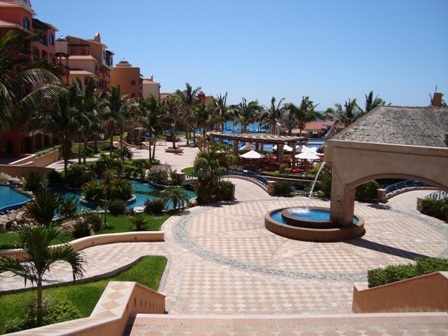 The Playa Grande Resort features all suites with private balconies, kitchens or kitchenettes, and distinctive touches such as marble floors, granite countertops and handcrafted furniture and decor. Relax in your luxury suite, designed with warm coastal decor that reflects the tranquility and beauty of Los Cabos itself. Get swept away by the sounds of the beach, as you relax in a plush king bed. Order room service and enjoy drinks on your private terrace as you lounge in the cool breeze. 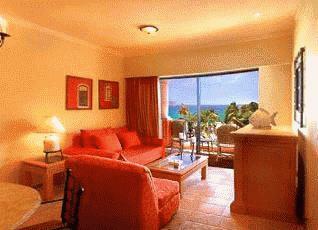 Enhance your vacation with satellite TV, wet bars, kitchens, dining rooms and whirlpool bathtubs. With a vibrant location in that celebrates the best of Cabo San Lucas, our suites are your paradise at beautiful Land's End. 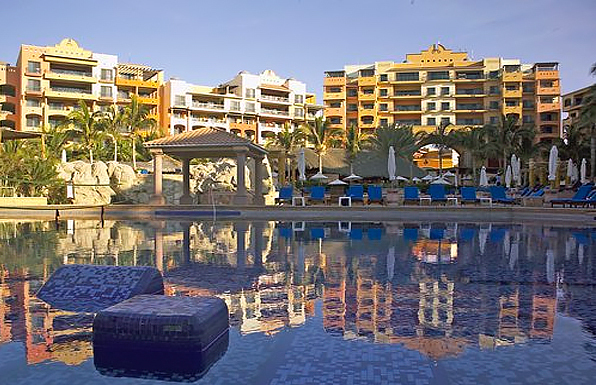 If it's shopping, fine dining and nightlife you're looking for, downtown Cabo San Lucas is just a short stroll away. And if you'd really like to reward yourself, the world class Grand Spa will be waiting with a full range of luxuries that will nurture your body and soul. This is living - in the best tradition of Cabo!